Life is different for kids today. Between standardized testing, the Common Core Curriculum, copious homework assignments, and seemingly endless amounts of “screen time,” it’s hard for kids – and parents – to know what’s most essential. 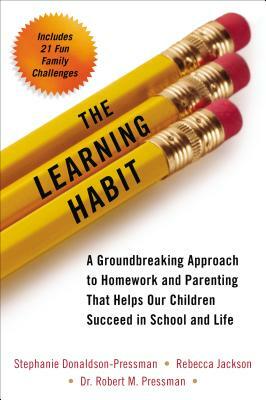 How can parents help their kids succeed – not just do well “on the test” -- but develop the learning habits they’ll need to thrive throughout their lives? Stephanie Donaldson-Pressman is a psychotherapist, consultant, and internationally recognized author in the field of family therapy. She is the author of The Narcissistic Family, and Clinical Director of New England Center for Pediatric Psychology. Rebecca Jackson is a writer and neuro-psychological educator whose writing is featured on the GoodParentGoodChild website and Huffington Post Screen Sense. Dr. Robert M. Pressman is a Board Certified Family Psychologist, a practicing pediatric psychologist, and Director of Research at the New England Center for Pediatric Psychology. "As kids rely more and more on digital forms of communication, their verbal skills are eroding. If you are raising kids, this book is an essential tool." “This book presents one of the most important and innovative approaches to parenting and habit formation I’ve seen in years. It’s a must-read for parents and educators."